The tecate cypress is a relict. 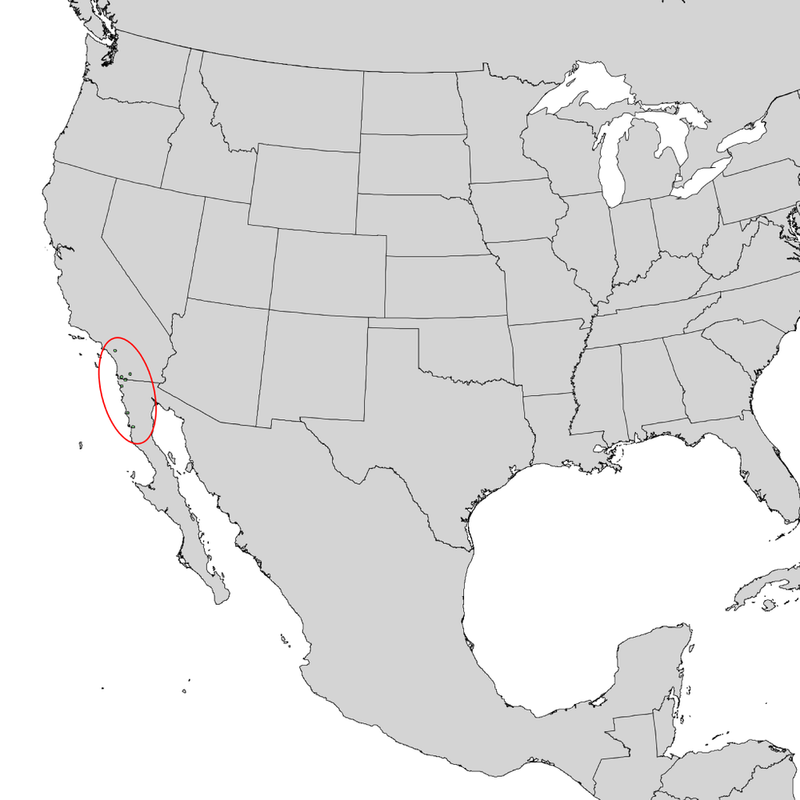 Its tiny geographic distribution encompasses a handful of sights in southern California and northwestern Mexico. It is a holdover from a time when this region was much cooler and wetter than it is today. It owes its survival and persistence to a combination of toxic soils, a proper microclimate, and fires that burn through every 30 to 40 years. However, things are changing for the Tecate cypress and they are changing fast. The fires that once ushered in new life for isolated populations of this tree are now so intense that they may spell disaster. The taxonomy of the Tecate cypress has undergone a few revisions since it was first described. Early work on this species suggested it was simply a variety of Cupressus guadalupensis. Subsequent genetic testing revealed that these two trees were distinct enough to each warrant species status of their own. It was then given the name Cupressus forbesii, which will probably be familiar to most folks who know it well. Work done on the Tecate cypress back in 2012 has seen it moved out of the genus Cupressus and into the genus Hesperocyparis. As far as I am concerned, whether you call it Cupressus forbesii or Hesperocyparis forbesii matters not at this point. The Tecate cypress is an edaphic endemic meaning it is found growing only on specific soil types in this little corner of the continent. It appears to prefer soils derived from ultramafic rock. The presence of high levels of heavy metals and low levels of important nutrients such and potassium and nitrogen make such soils extremely inhospitable to most plants. As such, the Tecate cypress experiences little competition from its botanical neighbors. It also means that populations of this tree are relatively small and isolated from one another. The Tecate cypress also relies on fire for reproduction. Its tiny cones are serotinous, meaning they only open and release seeds in response to a specific environmental trigger. In this case, its the heat of a wildfire. Fire frees up the landscape of competition for the tiny Tecate cypress seedlings. After a low intensity fire, literally thousands of Tecate cypress seedlings can germinate. Even if the parent trees burn to a crisp, the next generation is there, ready to take their place. At least this is how it has happened historically. Much has changed in recent decades and the survival of these isolated Tecate cypress populations hangs in the balance. Fires that once gave life are now taking it. You see, decades of fire suppression have changed that way fire behaves in this system. With so much dry fuel laying around, fires burn at a higher intensity than they have in the past. What's more, fires sweep through much more frequently today than they have in the past thanks to longer and longer droughts. Taken together, this can spell disaster for small, isolated Tecate cypress populations. Even if thousands of seedlings germinate and begin to grow, the likelihood of another fire sweeping through within a few years is much higher today. Small seedlings are not well suited to cope with such intense wildfires and an entire generation can be killed in a single blaze. This is troubling when you consider the age distributions of most Tecate cypress stands. When you walk into a stand of these trees, you will quickly realize that all are of roughly the same age. This is likely due to the fact that they all germinated at the same time following a previous fire event. If all reproductive individuals come from the same germination event and wildfires are now killing adults and seedlings alike, then there is serious cause for concern. Additionally, when we lose populations of Tecate cypress, we are losing much more than just the trees. As with any plant, these trees fit into the local ecology no matter how sparse they are on the landscape. At least one species of butterfly, the rare Thorne's hairstreak (Callophrys gryneus thornei), lays its eggs only on the scale-like leaves of the Tecate cypress. Without this tree, their larvae have nothing to feed on. Thorne's hairstreak (Callophrys gryneus thornei), lays its eggs only on the scale-like leaves of the Tecate cypress. Although things in the wild seem uncertain for the Tecate cypress, there is reason for hope. Its lovely appearance and form coupled with its unique ecology has led to the Tecate cypress being something of a horticultural curiosity in the state of California. Seeds are easy enough to germinate provided you can get them out of the cones and the trees seem to do quite well in cultivation provided competition is kept to a minimum. In fact, specimen trees seem to adapt quite nicely to California's cool, humid coastal climate. Though the future of this wonderful endemic is without a doubt uncertain, hope lies in those who care enough to grow and cultivate this species. Better management practices regarding fire and invasive species, seed collection, and a bit more public awareness may be just what this species needs.